I've actually seen people try to hack around the Labels field by creating different types of labels to enable multi-level tagging. 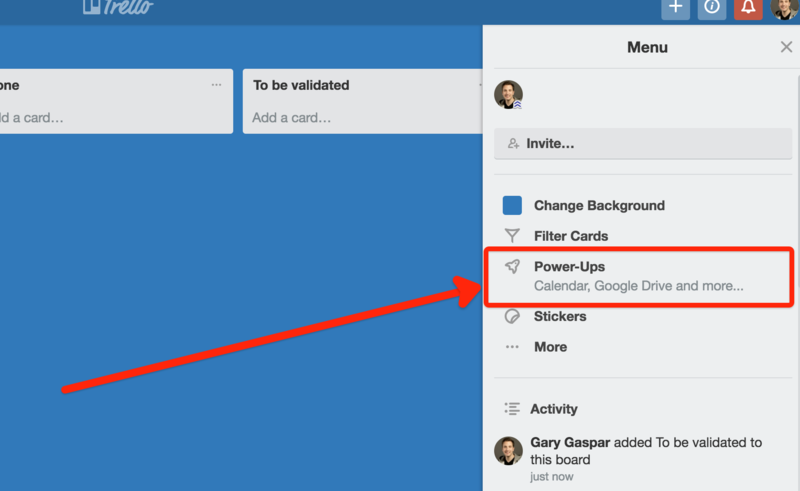 That's why we're so excited about Trello's Custom Fields Power-Up! It's the perfect way to keep your boards simple, while adding an extra layer to help you structure, sort and filter your cards like a pro. Marker.io now supports Trello Custom Fields. 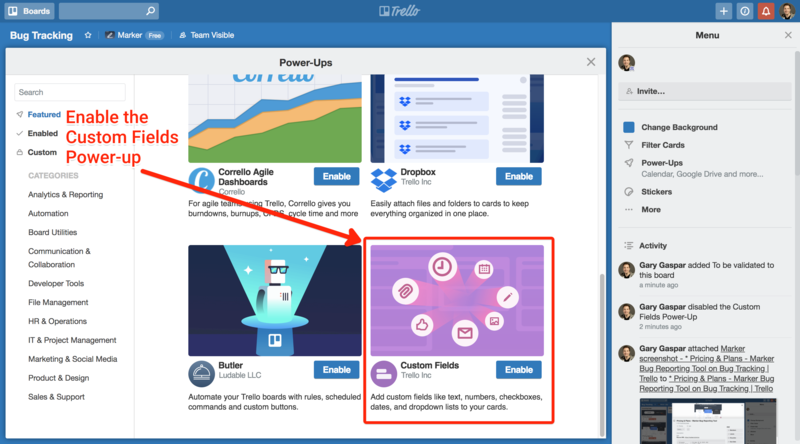 Read our easy guide on how to configure Trello's Custom Fields on your boards and cards - and discover how to use them in Marker.io. This guide will make your team so much more effective at bug reporting. 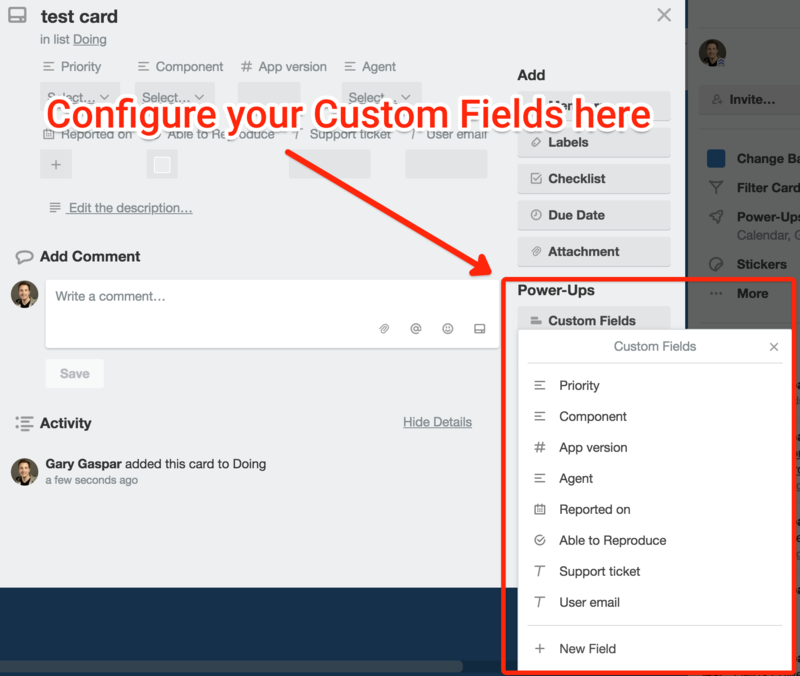 The first important concept you need to understand about Trello's Custom Fields is that they are configured at the board level and available on all cards in that particular board. To get started, create or open your Trello board (we recommend creating a bug tracking board based on this template). Look for the Custom Fields Power-Up and enable it. Some people recommend creating fields for browser version, operating system and screen size, but since Marker.io already captures and includes this data into the card's description automatically, there is no need to create more work for your reporters. When your board is fully set up, go to your website, snap a screenshot using Marker.io's browser extension and make sure to select the right board. If you’re not yet familiar with our tool, Marker.io is a screenshot tool that helps non-technical people easily report visual bugs and tasks directly inside Trello. Read more on how you can use Marker.io for bug tracking in Trello. Still in your Marker.io editor, open the "More options" menu to see all Trello fields associated with the selected board. 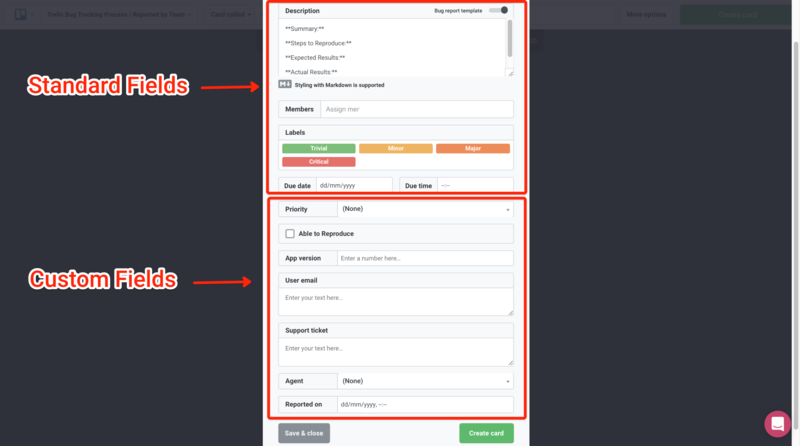 Once the "More option" menu is open, you'll see all fields from your Trello board. Side note: If you're curious to learn more about the bug reporting template inside the description field, learn more about creating your own team reporting template here. 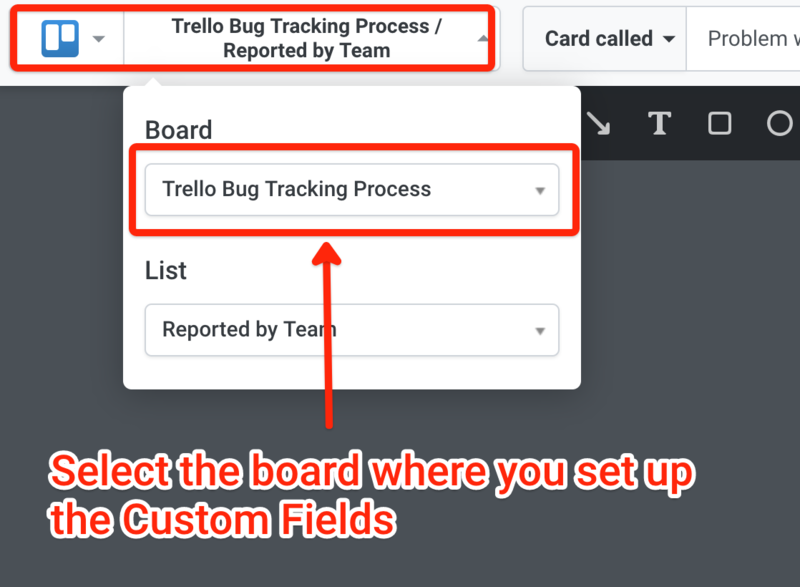 By setting up custom fields in Trello and using Marker.io to create visual Trello cards, you'll not only speed up your bug reporting workflow, but perhaps more importantly, you will make your development team super happy! Trello's Custom Fields can be extremely powerful in making sure that all bug reports follow the format that's most useful for your developers. 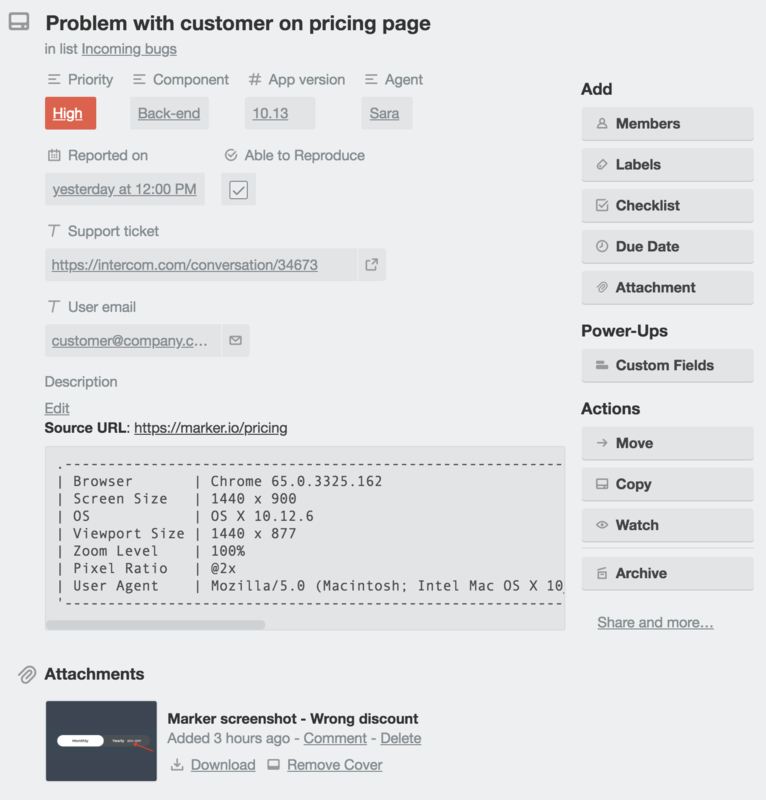 By configuring Custom Fields in your bug tracking Trello boards and using Marker.io to create informative visual cards, you'll ensure both reporters and developers have a great experience.